An independent judiciary that is free of corruption and external influence is a vital component of a healthy democracy. 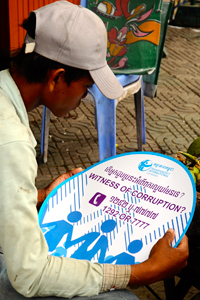 Yet Transparency International Cambodia’s first National Integrity System assessment (NIS), shows that although it has made huge progress since the fall of the Khmer Rouge regime, Cambodia’s judiciary still has quite a long way to go. 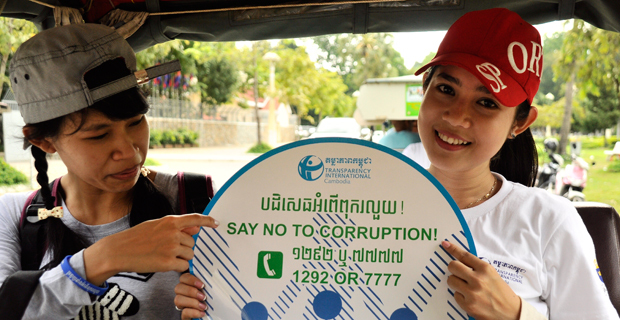 The report finds Cambodia’s entire integrity system too weak to uphold the rule of law in a country that ranked 160th out of 177 in Transparency International’s Corruption Perceptions Index 2013. The report also indicates the judiciary to be its weakest pillar. Courts are plagued by political influence and endemic corruption. The courts are insufficiently funded, with low-paid, poorly trained court officials being highly susceptible to corruption and outside influence. The payment of bribes to judges is often expected and commonplace in order for defendants to ensure a ruling in their favour. The lack of separation between the judicial and executive branches has also led to a harmful politicization of the judicial system. Three laws recently passed in May 2014 with the intention of strengthening the judiciary have failed to fix the problem. Judges and prosecutors are appointed by the Ministry of Justice and a majority of them are members of the ruling party with little option but to execute party instructions. It is common knowledge that aspiring judges are required to bribe their way into the Royal Academy for Judicial Professions where they are trained, and then pay more bribes to be appointed. Promotions and appointments are therefore based on political patronage and bribery rather than merit, undermining both the professionalism and the independence of the institution. Independent journalist Mam Sonando was sentenced to twenty years in prison in 2010 for allegedly leading an ‘insurrection’, on what rights groups described as trumped-up charges that lacked credible evidence. His sentence was later overturned on appeal and he was instead given a five-year suspended sentence – meaning that he is still guilty in the eyes of the law. Of particular concern is that the reasons behind judges’ decisions are rarely made public, opening the door to arbitrariness and abuse. As a result, well-connected individuals accused of serious offenses are afforded impunity while politically-motivated charges are brought against those who oppose the government or speak in defence of human rights. The report highlights a number of such instances, where journalists and activists were imprisoned on trumped-up charges by a system built on political patronage and bribery. Conversely, well-connected individuals accused of serious crimes are allowed to walk free. Rights groups have said that the failure to arrest Chhouk Bundith, the former Bavet City governor accused of shooting into a crowd of protesters and injuring three garment workers, is proof of rampant impunity and a corrupt court system. In consultation with relevant stakeholders, review and amend the three judicial reform laws passed in May 2014 to ensure independence of the judiciary. A judicial system pervaded by bribery and political influence undermines confidence in governance and sends the wrong message to the people – that in this country corruption is tolerated. Without tackling these issues head-on, the Cambodian government will not be able to achieve meaningful and far-reaching reform.